Come visit LeRoy, a historic village, with tree lined streets and classic Victorian houses, only five minutes from I 490 and Exit 47 of the New York State Thruway. 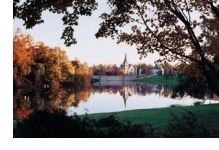 LeRoy is one of the most beautiful villages in Western New York, nestled along the scenic Oatka Creek. Only an hour from Niagara Falls and 30 minutes from downtown Rochester, LeRoys bed and breakfast accommodations and restaurants offer a relaxed, quiet atmosphere, away from the hustle and bustle of nearby cities. LeRoys unique history includes the Birthplace of Jell-O, Americas Most Famous Dessert in 1897. LeRoy was once the home of Ingham University, the first womens university in the United States, founded in 1837 and chartered in 1856. LeRoy is also the birthplace of the stringless bean, cultivated by Calvin Keeney. One of the more interesting features of LeRoy, is the documented route of the Underground Railroad, which can be explored by a 17 mile driving tour. The rich history of LeRoy is preserved by the LeRoy Historical Society at the historic 1822 LeRoy House at 23 East Main Street. Each summer, the Historical Society features a new Jell-O exhibit in the recently renovated 1898 High School, located behind LeRoy House. LeRoy offers a wide variety of casual dining, with over a dozen excellent restaurants and antique shops that are scattered throughout LeRoy on Route 5. Accommodations are also available in LeRoy at several quaint bed and breakfasts. There are also three campsites within 10 minutes of town. Golfers can enjoy an 18 hole golf course at the LeRoy Country Club, which is open to the public. Saturday nights, during the summer, midget racing is featured at the Limerock Speedway, east of town. Trout fishing along the Oatka Creek is enjoyed by many anglers throughout the fishing season. Genesee Country Museum, one of the largest outdoor living history museums, is conveniently located only 10 minutes east of LeRoy. And, the unique shopping experience of historic Gaslight Village of Wyoming, is only 20 minutes south on Route 19. Letchworth State Park is 30 minutes south in Mt. Morris. Approximately 20 minutes west of Leroy is Six Flags Theme Park at Darien Lake. The 30th annual Oatka Festival will be held July 14 and 15 from 10:00 AM until 6:00 PM on the banks of the Oatka Creek, school grounds, and Trigon Park in the center of town. Free parking and free admission makes this annual community festival a very popular family event. There will be a parade at 11:00 AM July 14. The festival offers a large craft show, an avenue of food booths, and non-stop musical entertainment for the entire family.